What was supposed to be a great flood control project that kept homes safe in the South Bay has turned into a nightmare for many homeowners. Damian Trujillo reports. What was supposed to be a great flood control project that kept homes safe in the South Bay has turned into a nightmare for many homeowners. Repair crews continue to work on Ridgemont Drive in San Jose, where they are replacing brick pillars residents claim were damaged by the pounding to the flood control project along the Silver Creek. Homeowners are footing the bill for the repairs and say someone else should be paying. David Williams says he heard construction for the project all day for three years in his back yard. "I feel everything, and I'm bouncing around the floor," Williams said. The homeowners say sidewalks cracked, irrigation pipes shifted and garage doors became uneven. "My driveway is completely cracked and I don't know if that's going to make it all the way into my garage," homeowner Theresa said. The Santa Clara Valley Water District referred us to its contractor, Bothman Construction. Bothman said the issue remains an acive investigation and that its assessors are looking into the homwoners' claims. 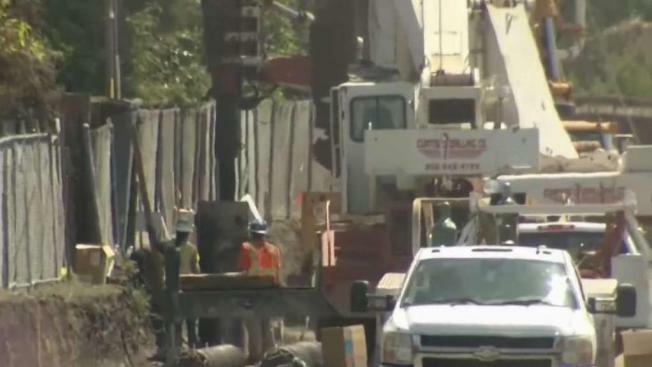 But Williams shared an e-mail with NBC Bay Area that shows Bothman's insurance company claiming the construction company is not at fault, yet they agree to pay him $1,850. Williams said no and is demanding a full inspection, and repairs from either the water district or the construction company. "I have cracks in my ceiling now. Doors won't close," Williams said. "We didn't sign up for that. Nobody here did." To add insult to injury, Williams said the city ordered him and his neighbors to repair the damaged sidewalks because they would become a hazard. They paid out of pocket for those repairs, up to $5,200 each.